Who will play The Doctor in the rumoured big-screen version of Doctor Who? 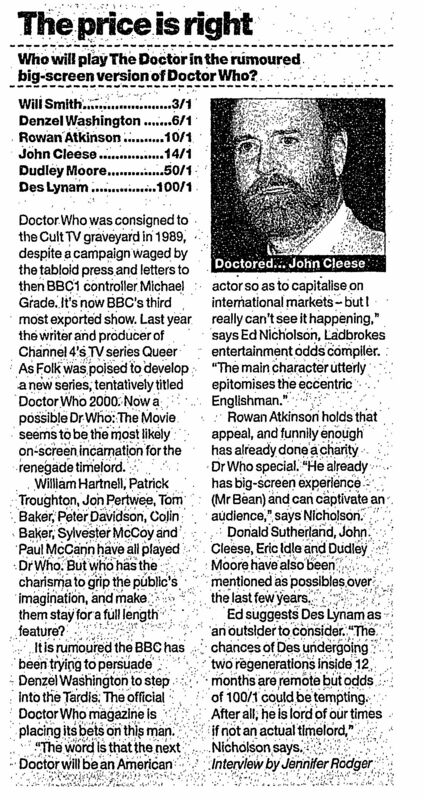 Doctor Who was consigned to the Cult TV graveyard in 1989, despite a campaign waged by the tabloid press and letters to then BBC1 Controller Michael Grade. It's now BBC's third most exported show. Last year the writer and producer of Channel 4's TV series Queer as Folk was poised to develop a new series tentatively titled Doctor Who 2000. Now a possible Dr Who: The Movie seems to be the most likely: ; on-screen incarnation for the renegade	timelord. It is rumoured the BBC has been trying to persuade Denzel Washington to step Into the Tardis. The official Doctor Who magazine is placing its bets on this man. "The word that the next Doctor will be American actor so as to capitalise on international markets-- but I really can't see it happening," says Ed Nicholson, Ladbrokes entertainment odds compiler. "The main character utterly epitomises the eccentric Englishman." Rowan Atkinson holds that appeal, and funnily enough has already done a charity Dr Who special. "He already has big-screen experience (Mr Bean) and can captivate an audience", says Nicholson. Donald Sutherland, John Cleese, Eric Idle and Dudley Moore have also been mentioned as possibles over the last years. Ed suggests Des Lynam as an outsider. "The chances Of Des undergoing two regenerations inside 12 months are remote but odds of 100/1 could be tempting. After all, he is a lord of our times if not an actual timelord," Nicolson says. APA 6th ed. : Rodger, Jennifer (1999-09-09). The price is right. The Guardian p. 22. MLA 7th ed. : Rodger, Jennifer. "The price is right." The Guardian [add city] 1999-09-09, 22. Print. Turabian: Rodger, Jennifer. "The price is right." The Guardian, 1999-09-09, section, 22 edition. This page was last modified on 3 January 2015, at 20:08.